All over the world, service providers, printers, agencies, publishers and editors today are under a competitive pressure that has never been experienced before. VIVA publishing technology helps companies in the media branch to optimize their communication, co-ordination and creation processes in the creation of documents/print products while at the same time increasing customer loyalty. With constantly rising costs and sinking margins, companies in the media branch worldwide must act faster and be more flexible. What should one then do, when you have to save on costs and time and at the same time increase customer loyalty? 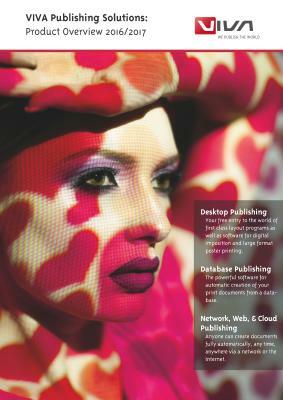 Is “Web-to-Print” really the right solution in all cases? Costs and benefits are out of proportion. The offer is exchangeable, as competitors also offer comparable products and conditions. The offer is limited to just a few product types due to the technical limitations of Web-to-Print solutions. The focus of the bid is on the price, not on the service. Such errors can be avoided with VIVA publishing solutions and concepts. VIVA provides solutions and concepts that can be adapted to any cost environment, that cover the whole range of graphic design products and that enable companies in the media branch to offer their customers a unique service. We provide companies in the media branch and their end users with flexible tools, with which not only business documents, but also all kinds of documents/printed matter such as catalogs, posters and billboards, ads, packaging, books, price lists or business reports can be created manually, semi-automatically or even fully automatically. Our publishing technology and products help companies in the media branch to optimize their communication, co-ordination and creation processes in the creation of documents/printed matter and at the same time increase customer loyalty. With VIVA solutions and concepts, even the most varied goals of companies in the media branch and the end users/customers can be reconciled: While service providers, printers and agencies strive for customer loyalty, end users/customers strive for independence. How can that be reconciled? Viva publishing technologies are based on the concept of giving companies in the media branch maximum security and at the same time giving the end users a high level of freedom and simplicity in the creation of documents. With our solutions and concepts, not only Web based, but also desktop based or even combined workflows can be achieved, which is interesting for many customers, particularly for larger projects. As well as the actual implementation of the graphic layout, considerable organizational processes are necessary for the creation of the documents. Communication and co-ordination between the internal and external product or project managers and the graphic designers with regard to content and design is costly and time-consuming. To achieve a saving effect, both the internal and external work processes must be accelerated dramatically and investment reduced to a minimum. This is where the Viva technology comes in. With the help of Viva publishing technology, it is no longer the graphic designer who produces the necessary documents, but rather the end users themselves. This happens right away and without any prior knowledge of graphics programs or technical printing requirements. The graphics designers just ensure that the employee has the appropriate templates at his disposal. Viva is one of the leading technology companies worldwide in optimizing marketing processes. Hardly any other manufacturer of standard software offers more options for optimizing marketing processes or for the creation of printed matter. Even competing products can be integrated into our workflow processes. With Viva publishing technology you have the chance of saving a lot of time and money by decisively optimizing the communication, coordination and creation processes in the creation, editing and management of marketing documents.